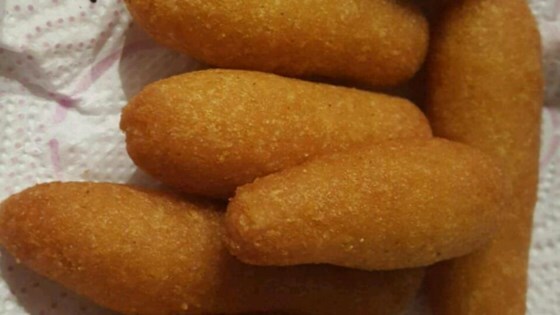 "Have you gone to a Puerto Rican get-together and tried the famous fried corn sticks or 'sorullitos?' Here's a recipe that works to stuff them with American cheese or have them plain. Enjoy!" Stir the cornmeal, sugar, salt, and water together in a mixing bowl until a dough has formed. Set aside to cool for 10 minutes. Once cool enough to handle, place a spoonful of dough into the palm of your hand; make a depression in the center. Fold a half slice of American cheese into a wad and place into the hole. Spoon some more dough overtop; roll the corn stick into a sausage shape, making sure that the cheese is not exposed. Repeat with the remaining dough and cheese. Heat oil in a large skillet to 375 degrees F (190 degrees C). Cook the corn sticks in the hot oil until they turn golden brown and float to the top of the oil, about 4 minutes per side. Drain on a paper towel-lined plate before serving. Oh my! I remember my grandma used to make these for my brother and I.
my boyfriend is sure to love these!